Teach: how to carry out safety checks and record them so that you can demonstrate your commitment to maintaining safe opportunities for children to play creatively. Offer: template documents and all the latest good practice guidance. Demonstrate: Practical assessment of a local facility. Workshops and training are available to improve knowledge and awareness in health promotion, prevention and protection. Part of a national Trading Standards Scams Team initiative, Friends Against Scams empowers communities to prevent people from becoming victims of scams. Resource: Calling all community spokespeople and community information hubs! There are vulnerable people in all of our communities who sometimes need a bit of impartial support, or guidance, especially where they are unhappy about an experience they have had with an NHS service. For many people rising energy bills are one of the biggest concerns this winter – but what can you do to save money? Could your service users benefit from The Joy of Food - Cookery Skills Courses in Norfolk? 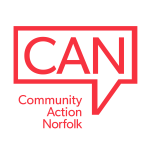 Joy of Food, in conjunction with Norfolk Community Learning Services, is open to individuals over 19 years old, or demonstartion "taster" sessions for younger groups. Acas have a free online learning hub. Social Entrepreneurs Programme support for social enterprise projects through the School for Social Entrepreneurs. Support, training and funding is available for community or social enterprise projects. NHS England has launched an online course for people who provide care and support to those with learning disabilities and/or autism, or who are in a Transforming Care Partnership (TCP).